Performances: December 1 and 2, 11 a.m. & 2 p.m. Relaxed Performance – December 2, 2018 at 11 a.m.
A relaxed performance is specifically designed to welcome individuals who may benefit from a less restricted audience environment and relaxed sensory experience. People of all abilities are welcome. The opera itself is unchanged, but some minor adjustments may be made to reduce the startling effects of any intense lighting or sound. Additional supports such as a visual guide provides a detailed description of what it’s like to visit the Joey and Toby Tanenbaum Opera Centre and the entire opera experience. Relief areas will also be set up in the main lobby space immediately outside the theatre for any individuals who wish to take a break during the performance. If you’d like to learn more about this performance or need help in determining if it fits the needs of your family, please call us directly at 416-306-2307. We’re here to help! Performances: November 28 and 29, 10 a.m. & 1 p.m.
Pre-show workshops: Contact 416-306-2392 or [email protected] to book your free workshop! The opera will be performed in the Imperial Oil Opera Theatre, located at the Joey and Toby Tanenbaum Opera Centre (227 Front St. E.). Please note that the Toronto Christmas Market will be in full swing in the Distillery District, not too far away from the Joey and Toby Tanenbaum Opera Centre. Traffic may be heavier than usual and it may take some time to find a parking spot or get on public transit. Give yourself plenty of time to make it to your performance. There is no parking on site, however there are several paid parking lots within walking distance to the Joey and Toby Tanenbaum Opera Centre, as well as limited street parking. Visit Green P to find the nearest paid car parks to the Centre. To help plan your trip and for all up-to-date public transit options, including transit delays, detours, and alerts, visit ttc.ca. For details regarding any major road closures, please consult the City of Toronto website for more information. The opera is general admission (chair seating) with floor seating on cushy mats at the front of the audience for children and caregivers to get close to the action! For Will Call, please pick up your tickets at the Ticket Services desk in the lobby area. Please have a piece of identification or the credit card associated with the order ready to show to the Ticket Services staff. While the opera is best suited for young people ages 5 and up, younger children and babes in arms are welcome to attend; however, everyone is required to have a ticket. The December 2, 11 a.m. relaxed performance, a show during which there is more tolerance for noise and movement from the audience, may offer a more comfortable environment for a caregiver with very young children, but they are not obligated to attend this performance. Latecomers will be admitted at an appropriate time in the story. Since seats are first-come, first-served, latecomers will be subject to remaining available seats. Concessions will not be sold. Outside food is welcome in the lobby. Food should be consumed prior to the performances as it is not permitted in the theatre (with exception at the relaxed performance at 11 a.m. on December 1). A water fountain is available on-site, in the lobby area. Washrooms are located in the lobby, with one accessible stall in each washroom. The COC is committed to accessibility and we are continuously working to find ways to break down barriers and make the experience open to people of all abilities. Please contact Ticket Services at 416-363-8231 and let us know if you require any accommodations. The use of cameras, video cameras or sound-recording devices of any kind is prohibited in the Imperial Oil Opera Theatre during performances. The design and direction of the production is restricted under intellectual property law. Any person using an unauthorized recording device will be required to surrender or erase any recordings, photographic or digital images and may be asked to leave. No refunds will be issued. The use of mobile and smartphones and all other electronic devices is disruptive and is strictly prohibited during performances. In consideration of patrons with sensitivities, avoid wearing perfumed beauty products and fragrances. All sales are final. Payment is processed immediately on receipt of order, after which there are no cancellations or refunds. It is the responsibility of the ticket holder to check their ticket for the correct performance, location, day of the week and curtain time. Program and artists are subject to change without notice. Account information is confidential and any updates or changes must come from the account holder. Ticket exchanges, releases and reprints can only be made by those named on the account. To make arrangements for someone else to pick up your tickets, please call Ticket Services at 416-363-8231 or email [email protected]. Please allow for plenty of extra time when travelling to the theatre in inclement weather. We regret that tickets not used due to inclement weather cannot be refunded. Tickets may be exchanged through COC Ticket Services by phone or by completing the online form. Individual ticket exchanges are subject to a per-ticket service charge. Lost tickets can be replaced free of charge by contacting COC Ticket Services. If you forget your tickets on the day of the performance, there is no need to rush home. We will be happy to replace your tickets free of charge at the Imperial Oil Opera Theatre. Social Story and Visual Guide: This resource will help you and your child(ren) prepare for your visit to the Joey and Toby Tanenbaum Opera Centre. Visual Story: This visual narrative will help you and your child(ren) prepare for the opera, WOW Factor: A Cinderella Story. Performed by current and former (*) members of the Ensemble Studio. Joel Allison studied opera at the University of Toronto (UofT). Select credits include Leporello in Don Giovanni, the title role in Imeneo with UofT Opera, and Basilio in The Barber of Seville with Saskatoon Opera. This season with the COC, he sings the roles of Zaretsky in Eugene Onegin, Superior Senator in Hadrian, Schaunard in La Bohème, and Mr. Magnifico in The WOW Factor: A Cinderella Story (Opera for Young Audiences). When not singing, Joel enjoys spending time with his wife and their two Holland Lop rabbits, Don Giobunny and Loporello. Joel is also a big NHL and CFL fan. Originally from Calgary, Samuel Chan studied voice at the University of Cincinnati-College Conservatory of Music (CCM). His operatic credits include the Usher in Rigoletto (COC); Moralès in Carmen (Brott Music Festival); Gomatz in Zaïde, (City Opera Vancouver); Donkey in The Bremen Town Musicians and (Highlands Opera Studio); Ruggiero in Alcina (Opera D’Arte at CCM); and Pastore II/Apollo in L’Orfeo (Cincinnati Chamber Opera). Samuel loves books, especially classic crime fiction by Raymond Chandler, and spends a lot of his free time in coffee shops reading. Personal heroes include Martha Argerich, Julia Fischer, Marsha P. Johnson, and his parents. Qualicum Beach, British Columbia native Lauren Eberwein is currently enjoying her third year in the COC Ensemble Studio, where she has sung such roles as Wellgunde in Götterdämmerung, Giannetta in The Elixir of Love, Countess Ceprano in Rigoletto, and the Cook in The Nightingale and Other Short Fables. This season, she appears in Richard Strauss’ Elektra. A graduate of The Curtis Institute of Music and an Emerging Artist with Opera Philadelphia, Lauren is also an avid chamber musician and has made debuts at both Carnegie Hall and the Lincoln Center. When not making music Lauren enjoys painting, reading, practicing yoga, and spending time outside in the sun. Simona Genga, from Vaughan, Ontario, won First Prize and the Audience Choice Award at the 2017 Ensemble Studio Competition, and received her Master of Music in opera performance from the University of Toronto (UofT). This summer, she was listed as one of the CBC’s 2018 “30 hot Canadian classical musicians under 30”, and returned to the Gerdine Young Artist Program at Opera Theatre of Saint Louis to sing Annina in La Traviata. This season with the COC, she plays Second Maid in Elektra. When not practicing, Simona enjoys attempting DIY projects, writing poetry, and laughing at her own jokes. Rachael Kerr likes to wear many hats when it comes to the piano. As an opera repetiteur and coach, she served as rehearsal pianist for The Elixir of Love, Rigoletto and The Nightingale and Other Short Fables in the COC’s 2017/2018 season, and for Hadrian, Elektra, and La Bohème this season. She frequently collaborates with instrumentalists, and has performed as an orchestral pianist with the Toronto Symphony Orchestra, the Beijing Symphony Orchestra, the National Ballet of Canada, and the Niagara Symphony. When not behind a piano, Rachael enjoys doing yoga, cooking, and spending time with her new puppy. Alberta-born, French-Canadian pianist/composer Stéphane Mayer is a graduate of McGill University’s Schulich School of Music. Since joining the Ensemble Studio in 2016, he has been a member of the music staff for Norma, The Magic Flute, Louis Riel, Arabella, The Abduction from the Seraglio and Anna Bolena. As a composer, Stéphane’s works were recently showcased in the COC’s Free Concert Series in the Richard Bradshaw Amphitheatre. This summer, before returning to the COC Ensemble for a third year, Stéphane spent some time away from the piano and backpacked through western China for three weeks. Vancouver-born mezzo-soprano Simone McIntosh received her master of music from the Schulich School of Music at McGill University and her bachelor’s degree in opera from the University of British Columbia (UBC). Her credits include Tamiri in Il re pastore (Merola Opera); and Ruggiero in Alcina (Opera McGill). This season with the COC, she appears as Tisbe in WOW Factor: A Cinderella Story (Opera for Young Audiences), and the title role in La Cenerentola at Vancouver Opera. Simone enjoys knitting and crocheting the latest fashion trends, and annoying her roommate by finding new, creative places to store her massive shoe collection. German-Canadian soprano Anna-Sophie Neher recently completed her Master of Music degree at McGill University where she won the prestigious Wirth Vocal Prize. She has also studied at Bard College and the Montreal Conservatory. Winner of First Prize at the 2017 OSM Manulife Competition, her operatic credits include Blanche in Dialogues des Carmélites (Opera McGill); Adele in Die Fledermaus (Opera McGill); Pamina in The Magic Flute (Bard College); and Belinda in Dido and Aeneas (Montreal Conservatory of Music). Anna-Sophie loves learning languages, travelling the world, and playing ice hockey with good friends on cold winter nights. Anna studied operatic stage direction at the University of Toronto. Recent directing credits include Les Larmes du couteau/Hin und Zurück (Glenn Gould Conservatory), The Tender Land (Wilfrid Laurier), and the COC's Ensemble Showcase. This season with the COC, she will assistant direct La bohème in addition to directing WOW: Factor. Anna started dancing at the age of 2 and now she teaches others how to dance as a choreographer. She also loves swimming, playing tennis, and making friends with cats. Kate is the Stage Manager for Wow Factor. Last year she was the Stage Manager for The Magic Victrola, which was also an opera for kids. She has also stage managed The Elixir of Love and Götterdämmerung for the COC on the mainstage, as well as 15 operas as ASM. She started working at the opera company 14 years ago, even before the opera house was built! In her free time, Kate likes swimming and making quilts. She has been known to eat a lot of ice cream and her favourite flavours are salted caramel and mint chocolate chip. Toronto-born soprano Lauren Margison is a graduate of the Atelier lyrique de l'Opéra de Montréal, where her roles included Clorinda in La Cenerentola and Missia in Atelier lyrique’s production of La Veuve joyeuse. She was a first prize winner of the 2018 George London Competition, and was also the youngest finalist in the Meistersinger von Nürnberg competition in 2016. In 2017, she sang Micaëla in Carmen (Brott Music Festival), Fiordiligi in Così fan tutte (Highlands Opera Studio), and appeared in concert with the PRISMA Festival in Strauss’s Four Last Songs. She enjoys knitting and watching Lord of the Rings. Toronto-born tenor Charles Sy is completing an Artist Diploma in Opera Studies at the Juilliard School, completed his Bachelor and Master of Music at the University of Toronto and graduated from the Ensemble Studio in 2017. He won First Prize and Audience Choice in the 2014 COC Centre Stage Competition and won First Prize in the Oratorio Society of New York’s 2018 Solo Competition. Charles was listed as one of CBC’s 2018 “30 hot Canadian classical musicians under 30”, and recently sang the role of Agenore in Mozart’s Il re pastore at the Merola Opera Program. He is an avid video gamer, particularly of MMORPGs, and also has an extensive cute-phone-case collection full of unicorns, bears, and other adorable creatures. Joel likes music and stories. When he was younger, he was a boy and now finds himself all grown up and is a man. He directs operas with a lot of great companies and friends. He’s directed Carmen, Kopernikus and Brundibar among others. He’d like to direct an opera about cats and flying aliens. He’s the Founder and Artistic Director of Against the Grain Theatre. Joel enjoys watching the most up-to-date cartoons on TVO Kids and YTV Treehouse with his 4.5-year-old #OperaBoy. This is Kristin’s 16th season with the Canadian Opera Company. Select COC credits include stage manager for 2017’s An Evening With the Ensemble Studio, assistant stage manager for Eugene Onegin, The Elixir of Love, Peter Grimes, A Midsummer Night’s Dream, The Nightingale and Other Short Fables, and Die Walküre. Other stage management credits include: Seussical, Jacob Two-Two Meets the Hooded Fang, James and the Giant Peach, Annie, and A Year With Frog and Toad (Young People’s Theatre); Romeo and Juliet/A Midsummer Night’s Dream (Canadian Stage); Forbidden (Tapestry Opera). In her spare time, Kristin can usually be found with a book in her hand or spending time with her daughter, Ella. Siobhán is very happy to be lighting WOW Factor. She loves opera and light and colour and she thinks it’s super fun when she gets to put them all together! Other recent lighting design credits include Wilde Tales (Shaw Festival); Shrek, Miracle on 34th Street, A Year with Frog and Toad and The Addams Family (Neptune Theatre); On A First Name Basis, The Ladies Foursome (Theatre Aquarius); Les Liaisons Dangereuses and Avenue Q (Sudbury Theatre Centre); Elegies: A Song Cycle (Acting Up Stage); and The Last Resort (Globe Theatre). She is the associate lighting designer on the Canadian production of Come from Away. James Bolton is a Toronto-based set, costume, hair and make-up designer working in theatre, opera and film. James studied production design at York University then attended George Brown College, Yorkville School of Make-up, and Wink Makeup Academy. Recently James has designed sets for Orphee aux Enfers for University of Toronto Opera, The Tender Land for Wilfrid Laurier University, costumes for Daniel Cockburn’s latest film, The Argument (with annotations). James’ hair and make-up designs range from wild and creative, as seen in UofT Opera’s Prima Zombie: the Diva that just wouldn’t stay dead, to the simple and historically accurate, as seen in the Heritage Minutes for Lucy Maude Montgomery and Jim Egan. James is also active in designing children’s theatre across the GTA and working with students of all ages. 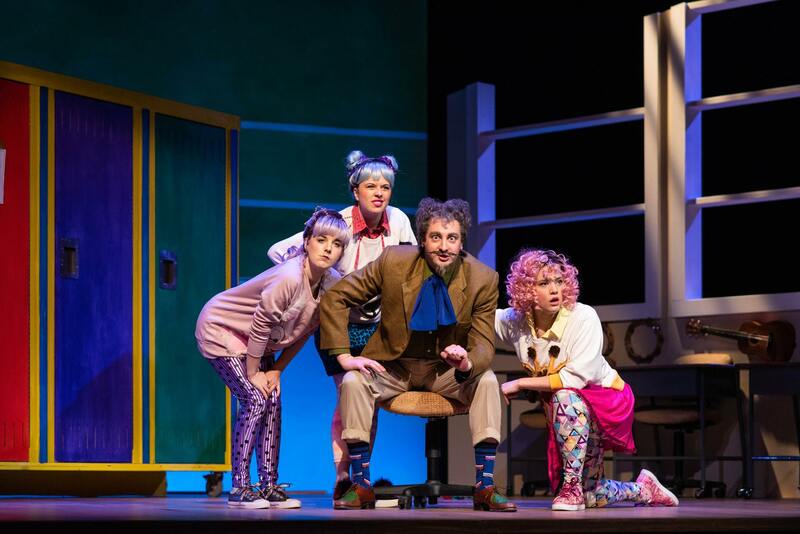 (l-r) Simone McIntosh as Tisbe, Anna-Sophie Neher as Chloe, Joel Allison as Mr. Magnifico and Lauren Eberwein as Phoebe in the Canadian Opera Company’s production of WOW Factor: A Cinderella Story (Opera for Young Audiences, 2018), photo: Gaetz Photography. 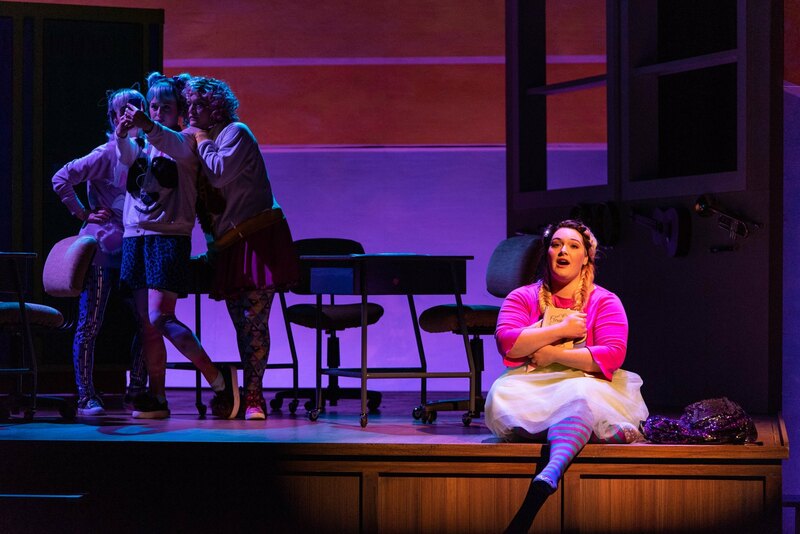 Simona Genga as Cindy (foreground) with (l-r) Simone McIntosh as Tisbe, Anna-Sophie Neher as Chloe and Lauren Eberwein as Phoebe in the Canadian Opera Company’s production of WOW Factor: A Cinderella Story (Opera for Young Audiences, 2018), photo: Gaetz Photography. 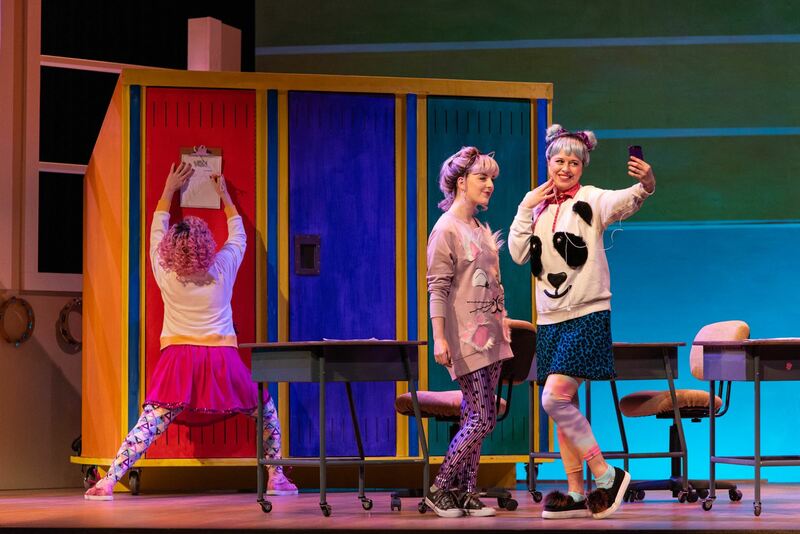 (l-r) Lauren Eberwein as Phoebe, Simone McIntosh as Tisbe and Anna-Sophie Neher as Chloe in the Canadian Opera Company’s production of WOW Factor: A Cinderella Story (Opera for Young Audiences, 2018), photo: Gaetz Photography. 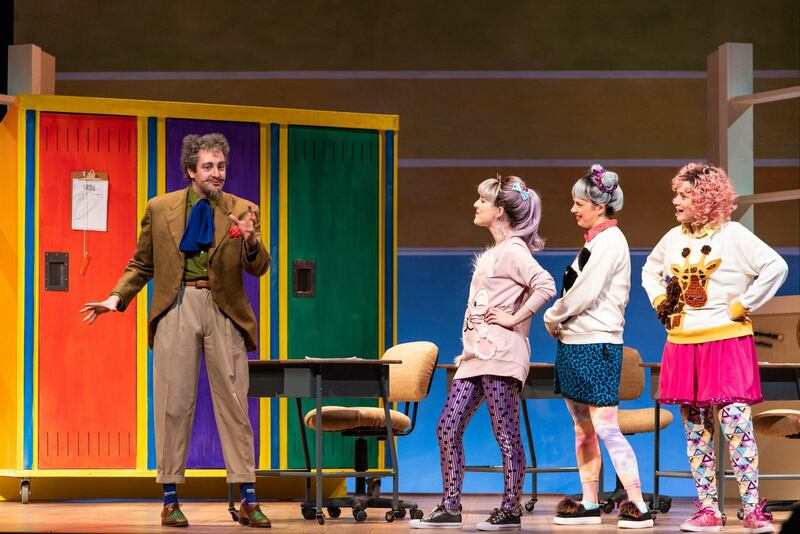 (l-r) Joel Allison as Mr. Magnifico, Simone McIntosh as Tisbe, Anna-Sophie Neher as Chloe and Lauren Eberwein as Phoebe in the Canadian Opera Company’s production of WOW Factor: A Cinderella Story (Opera for Young Audiences, 2018), photo: Gaetz Photography. *School groups contact Group Sales at 416-306-2356 or [email protected] for school performances on November 28 and 29.